You must make reservations at least 5 minutes in advance of the time at Nick and Jake's on Main. I only have one word for this place and that is "Awesome"
we had a great experience for a sunday brunch for seven of our family members. The service was excellent. The restaurant had a power outage earlier and no electricity means one must improvise and it was hot inside. But she made our stay pleasant. Good Sunday brunch buffet. It was pretty noisy and busy when we were there between 11:15 and 12:45. Slowed down right about 12:30. Excellent and affordable Sunday brunch. Love! We celebrated my birthday here last weekend. Food is ALWAYS wonderful! Can’t go wrong with the shrimp and grits, lobster Mac and cheese, and wings! Ambience is wonderful and my favorite bakery, Andre’s is right across the street for a sweet treat afterwards! One of our favorites! First time here, loved the atmosphere! They food was very flavorful . Staff friendly and helpful! We will definitely be back . We had a wonderful time, our server (Jacq?) was fantastic!! One of the staff (maybe an owner?) stood at a table near us for sometime speaking VERY loudly. Very distracting. Our waitress was excellent. Great menu with boiled shrimp, prime rib and cod fish featured. Food is constantly replaced insuring there is plenty that's fresh. Made to order omelets seem to be the big hit. Carrot cake and chocolate desserts were delicious, if you left room for them. Shrimp and Grits small plate was divine !! I would recommend it . Went for brunch, was our first time. Will definitely be back. Great food and awesome service! Brunch buffet food was cold and not fresh at all. Tasted like frozen food has been microwaved! Met with visiting relatives. Great food! Excellent SERVICE!! Responded to all our requests. There were 3 very large parties seated behind us - they were very noisy talking to people at the end of the table. We were unable to visit because of the noise level. The food was mediocre at best. One party's plate was barely warm, soups were lukewarm. Salads were fine. Since large parties were seated at same time we were I think a smaller party should be waited on first. We had an event to go to and had to ask about our order 3 times. I don't blame the waitress...it wasn't her fault. Big parties had their food first. Great food menu for Valentine’s Day! They are always amazing. I just hope with them having to be franchansed now the owner will realize that each neighborhood resturants likes to have its own original items as well as thier staples. We all had half chicken pear salad. Yummy and half was plenty. We we're ignored for 10 minutes after we sat down and then in the course of the next few minutes we had three different waiters introduce themselves as our waiter. Service was good after that. My wife ordered a filet mignon medium. It came out looking burnt, I am not sure how anyone let that come out of the kitchen. My wife tried to eat it but the main taste was charcoal. She finally couldn't stand it and sent it back. They were very good about replacing it and comped us a free desert. We had a great table, great waitress, good food. Everyone was very nice and everyone had a great time. We had a reservation and still had to wait 35 minutes to be seated. The server was rude, the food was ok, but not worth the wait. Great dining experience and the food was awesome. 4 of us went for our first visit during restaurant week and were blown away with our options. The high quality of food, including the entree, veggies and desserts, was outstanding. We all decided we will definitely be back! Restaurant week menu was delicious. I had the steak soup, red snapper and cheese cake. All were very good. It was our first time to Nick and Jake's during restaurant week. We had never been and this was the perfect time to try it. My husband loved his dinner but I was a little disappointed with mine. However, that being said I saw a lot of food coming from the kitchen that I would like to try. We are definitely going back. The service there was outstanding. We always enjoy Nick and Jakes. A great addition to the neighborhood. Great experience! We went to Nick & Jake's during Restaurant Week but we were not shuttled through in a rush. We really enjoyed our server and the service he provided even during a very busy Friday night! It was extremely loud that evening, but that just added to the experience - we tried not to let that dampen our experience!! 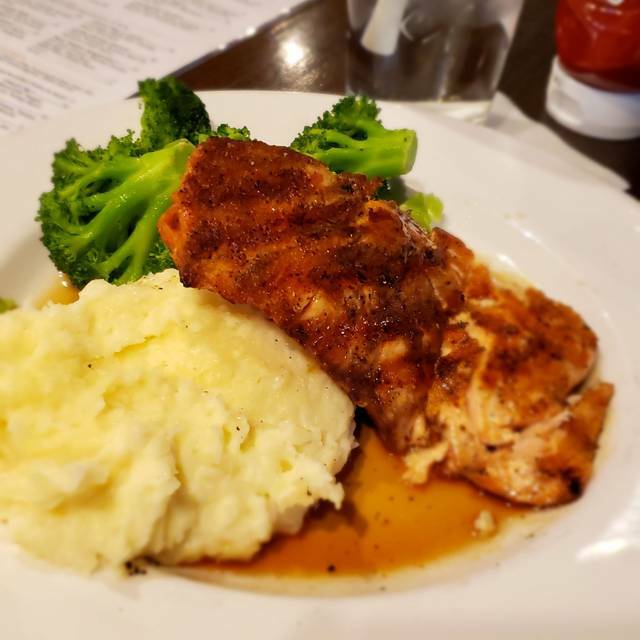 The bourbon glazed salmon was better the first time I had it, this second time it was not as good as I remember. My friend had the short rib pot roast with gravy which she said was very good. The steak soup is not traditional steak soup with tasty chunks of steak, rather it looks like ground meat. My waitress was very informative and pleasant. Overall a good experience and great value for KC restaurant week! Service was excellent!! Good for the price. Food was Great!! As always a perfect and great experience! Our waiter also remembered that we had a birthday in our party. Packed for New Years day brunch! Great specials! Been here a handful of times now and never been disappointed. Service and supervision are outstanding. We usually get sandwiches or salads. They are always very good as well. Large portions at reasonable prices.